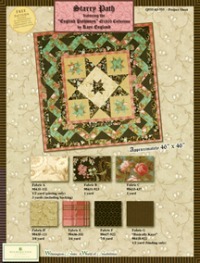 Free star quilt patterns for you to use to create your own stunning quilts. 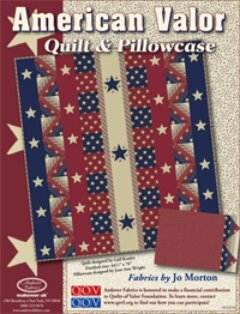 Star quilts have always been popular with quilters of all generations, all levels of quilting experience and from all around the world. They are so versatile and come in an almost unlimited range of designs. 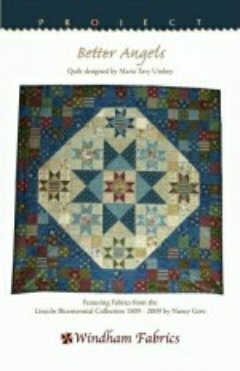 Whenever I am at quilt exhibitions, star quilts are always on display. They look fabulous in a wide range of fabrics. I love the brights but I have also enjoyed the 1930's fabrics used as well as those using plain fabrics. 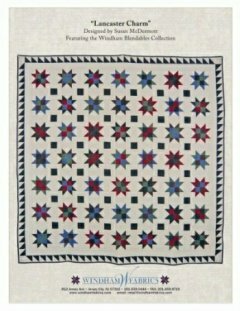 I hope you enjoy all the free star quilt patterns below. 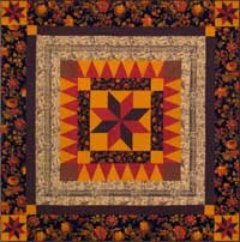 If you can't find what you are looking for I have placed a list of quilt pattern suppliers where you will find more free star quilt patterns here. 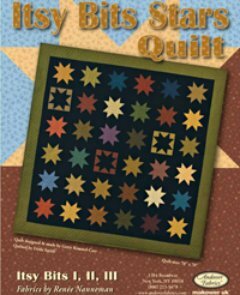 There are many more free star quilt patterns offered than I could possibly add here. Pattern courtesy of Windham Fabrics. 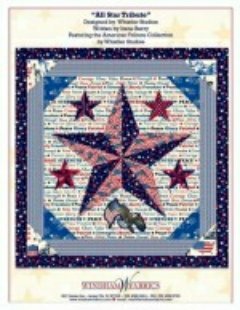 Under The Stars Quilt Pattern. Pattern courtesy of Wilmington Prints. 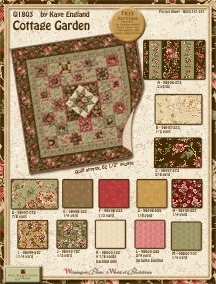 So Cottage Garden Quilt Pattern. Pattern courtesy of Wilmington Prints. 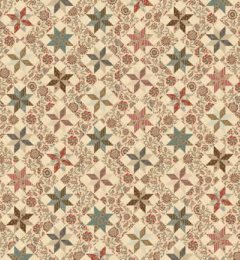 Starry Path Quilt Pattern. Pattern courtesy of Robert Kaufman. 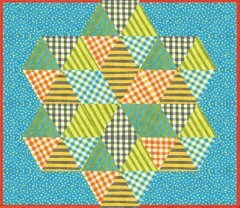 Hanah Quilt Pattern. Pattern courtesy of Robert Kaufman. Mama's Kitchen Quilt Pattern. Pattern courtesy of Red Rooster. 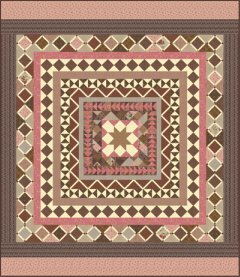 Isabella Quilt Pattern. Pattern courtesy of Andover. 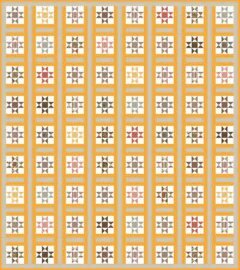 Itsy Bits Quilt Pattern. Pattern courtesy of Andover. 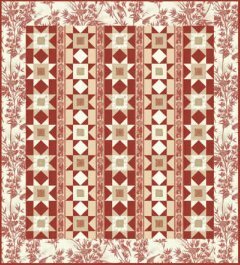 Winterthur Toile Quilt Pattern. Pattern courtesy of Hoffman. Merry and Bright Quilt Pattern. Pattern courtesy of Andover. 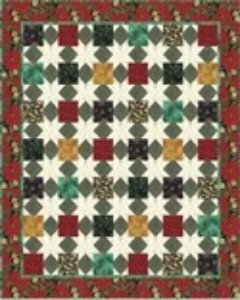 Keystone Quilt Pattern. Pattern courtesy of Windham. Better Angels Quilt Pattern. Pattern courtesy of Andover. 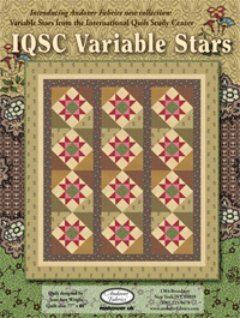 Variable Stars Quilt Pattern. Pattern courtesy of Andover. 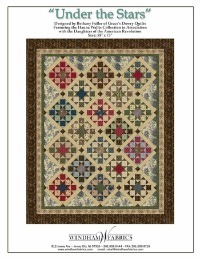 American Valor Quilt Pattern. Pattern courtesy of Moda. 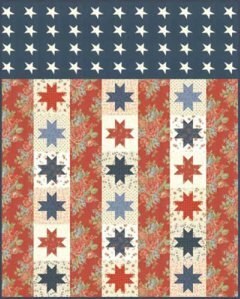 Flag of Valor Quilt Pattern. Pattern courtesy of Windham. All Star Tribute Quilt Pattern. Pattern courtesy of Moda. A Stitch In Color Quilt Pattern. Pattern courtesy of Moda. 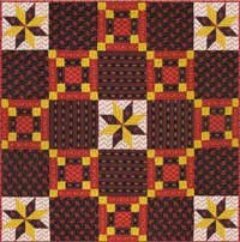 Charity Quilt Pattern. Pattern courtesy of Moda. Faith Quilt Pattern. Pattern courtesy of Moda. Hope Quilt Pattern. Pattern courtesy of Moda. 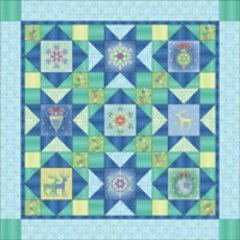 Lumiere De Noel Quilt Pattern. Pattern courtesy of Moda. Pashmina Quilt Pattern. Pattern courtesy of Windham. 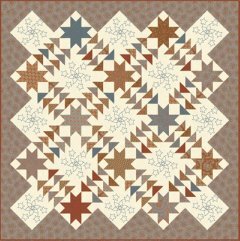 Lancaster Charm Quilt Pattern. Pattern courtesy of Moda. Fresh Flowers Quilt Pattern. Pattern courtesy of Benartex. 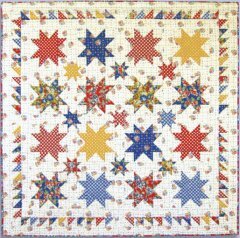 Star Bright Quilt Pattern. 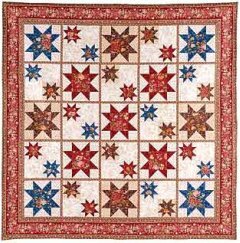 When making any star quilt there are several key points to remember to ensure success. If you are cutting more than one layer of fabric at the same time then ironing them together before you start will make them cling to each other. To prevent your blocks from distorting you need to plan how to cut out your fabric using the fabric grain. The outside edges of each block should have their edges cut along the lengthwise grain (along the selvage) or the crosswise grain (from selvage to selvage). If you have ever used or seen Marti Michell's templates they all have the grain-line marked on them with an arrow. Sew all seam allowances 1/4". Using a 1/4" foot is a great way to ensure all your seam allowances are accurate. Press seams in opposite directions as this helps them to lock in place when slight pressure is applied with your thumb and forefinger. To save you constantly getting up and down to the iron sew several blocks of the same construction at the same time then iron their seams. If you do have some slight distortion or seam irregularity lightly spray with starch and iron back into shape. After adding sashing or borders press the seams closed first before pressing them open. This will help the sashing and borders to sit better.